Heat olive oil on medium heat in heavy pan and cook onion, celery and leek ((carefully washed and sliced into small rings – white part and ½ of the green part) until soft, about 2 minutes. Stir in garlic and let cook for a few seconds. Add rinsed rice, mix with vegetables and fry for 30 seconds, stirring. Season with salt and pepper. (watch out the salt if not using low sodium broth). Add all of the chicken broth and bring to boil. When reached boil, turn down the heat to low, cover the pan and let it cook for 40 minutes – or until the rice is done. Before the rice is finished, prepare your fish. Cut it into small cubes and carefully remove any possible bones. In frying pan heat olive oil and butter. When hot, add fish, sprinkle with salt, pepper and the spices and fry quickly on medium hot. Add wine, stir together and let cook until the wine is almost reduced. Fluff the rice when ready with a large spoon. 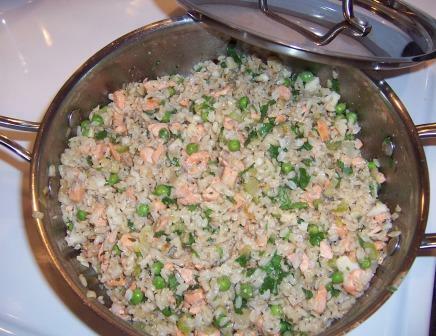 Add fish mixture to the rice with the created sauce and mix together. Add peas and let it warm up in the rice. Taste and add more seasoning if desired. Garnish with chopped parsley and enjoy.